I can’t tell you how excited I am about today’s guest poster! I “met” Tricia Goyer through The Better Mom, as we both contribute there. I have since started following her blog and reading her books and, guys, I’m hooked! 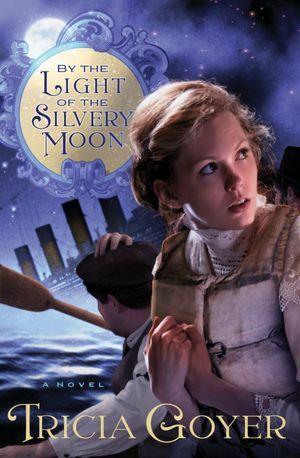 I’m honored to have her here today – the 100th Anniversary of the Titanic sinking – sharing about how the idea for her latest novel, By The Light Of The Silvery Moon, came together. Be on the lookout for a review of it here soon! Without further ado, here’s best-selling author, Tricia Goyer! Of course! I was excited about the idea, but there were so many possibilities. I wanted an idea that was fresh, unique, and faith-filled…where to start??? One morning I was laying in bed praying about an “Titanic idea” when the prodigal son story popped into my mind. The story of a younger son, an older son, a woman who cared for them both and a loving father played out in my mind. That’s it! The proposal came together, and in a few weeks I learned that Barbour wanted to publish my idea! When I hold By the Light of the Silvery Moon in my mind I’m still amazed that I was given the honor of writing this novel. It goes to show that some God-given ideas take years until they see the light of day while other bloom overnight. It’s impossible to know which is which, that’s why it’s so important to cling to God, and to listen to Him. We all need to trust He’s set a true course for our lives–a future that’s held in His hand. One that’s unsinkable. After leaving Southampton on 10 April 1912, Titanic called at Cherbourg in France and Queenstown, Ireland before heading westwards towards New York. The gash that the iceberg cut into the hull of the Titanic was between 220 to 245 feet long. The total length of the ship was approximately 882 feet. One of the first lifeboats to leave the Titanic carried only 28 people; it could have held 64 people. There were 472 lifeboat seats not used. The band played music up to the last few minutes before the ship went under. None survived. The Titanic was rediscovered on July 14th, 1986. 74 years after it sank. I’m looking forward to reading this one Tricia! Congratulations on your book deal That is great news. I loved being in Belfast as we celebrated the centenary of the Titanic – to celebrate the men who built her, and the craftsmanship and work that went into her, as well as remembering those who perished, was very powerful. I enjoyed your post, and especially liked the lines – We all need to trust He’s set a true course for our lives–a future that’s held in His hand. One that’s unsinkable. I am holding onto this hope right now.